← HUSBAND…One Word, Express In One Hundred Words In One Hundred Days. Appreciation…(One Word, Express In One Hundred Words In One Hundred Days). More so, if you think of any one word and you want me to write about it please email adedokunr@gmail .com. Real success Is Not What You Started But What You Complete. Real Success Is Not Comparing What You Have Done With What Others Has Done. Real Success Is Comparing What You Have Done With What You Should Have Done. I belief you will introduce your friends and family to our blog. 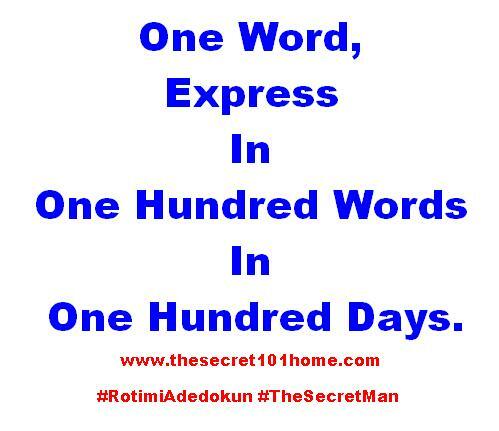 This entry was posted in Life and Time Management, Self Development, The Secret, Vitamin Of The Mind and tagged Bishop David Oyedepo on Success, Jim Rohn on Success, One Hundred Days, One Hundred Words, Pastor E A Adedokun On Success, Rotimi Adedokun Books, Success unlimited, What Is Success?, Word, Words Of God, writing project. Bookmark the permalink.